Campanile Tours are available after each concert. Linda Dzuris became Clemson's first University Carillonneur in 1999 and is a Professor of Music in the Department of Performing Arts. Additionally, Dzuris is a performance instructor of the North American Carillon School (NACS), which was established in 2013 as affiliate and American representative of the Royal Carillon School 'Jef Denyn' in Mechelen, Belgium. She received her B.M., M.M., and D.M.A. 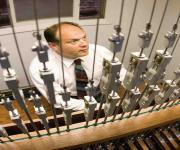 degrees in organ performance and church music from the University of Michigan. Carillon study was also done in Ann Arbor, MI, with additional study at The Netherlands Carillon School in Amersfoort, NL. Dzuris is a former board member and a current adjudicator on both the Carillonneur and the Associate Carillonneur Examination Committees of the Guild of Carillonneurs in North America. She has been a featured artist in carillon concert series throughout the United States and Europe, most recently as the North American representative at the 2017 World Carillon Federation Congress in Barcelona, Spain. American Carillon Music Editions and Yale University publish her original carillon compositions. Hans Zimmer: Time from "Inception"
Mark Konewko , PhD, is currently the Marquette University Carillonneur, Director of the University Chorus and Chamber Choir and Professor of Practice in the Department of Digital Media and Performing Arts. He has directed choirs and performed nationally and internationally on organ and carillon in Germany, The Netherlands, France, and Italy. His studies on the carillon include work with Todd Fair, Jacque Maassen, and Bernard Winsemius at the University of Utrecht; Amersfoort, The Netherlands. Awards and honors include the Gold Medal of Recognition, Grande Maestro from Badia Tedalda, Italy, a scholarship to the Netherlands Carillon School, and a Certificate of Excellence in Carillon Performances from the University of Utrecht; Amersfoort, The Netherlands. He enjoys the orthodox and the innovative in music specializing in early Italian music, the American folk music tradition, and contemporary performance art. 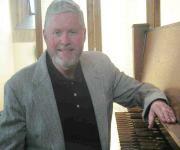 Ray McLellan, was appointed University Carillonneur at Michigan State University in 1997, where he teaches and performs on the 49-bell Beaumont Tower Carillon. McLellan earned his BA degree at Florida Southern College in Lakeland, MM and DMA degrees from the University of Michigan in Ann Arbor. He also studied in Freiburg, Germany and Amersfoort, The Netherlands. In addition to his work at MSU, Dr. McLellan serves as organist/music director at St. Michael the Archangel Parish in Monroe, and as organist/accompanist at Temple Beth Emeth in Ann Arbor. He has performed recitals in the USA, Canada, The Netherlands, France and Germany. McLellan currently serves on the exam committee and has co-chaired the Barnes Scholarship Committee, and has been chair of the Nominations Committee of the Guild of Carillonneurs in North America. He is also a member of the faculty of the North American Carillon School. 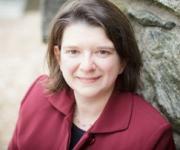 Ellen Dickinson is Director of Bell Programs at Yale University, and College Carillonneur at Trinity College in Hartford, Connecticut. Over twenty of her students have completed the exam process to become Carillonneur members of the Guild of Carillonneurs in North America (GCNA). Ellen is the author of "The Yale Carillon Method," a beginning carillon lesson book used at many carillons around the country. In 2016, Ellen composed "The Well-Tempered Carillonist," a book of 48 studies in all major minor keys, in the form of preludes and toccatas. She has served the GCNA in many capacities, including as vice president, and exam juror, and she currently works on Music Publications and Professional Concerns. 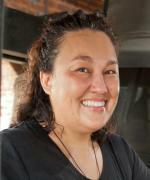 As part of the North American Carillon School team, Ellen is an instructor for the New England region. Ellen attended the Summer Academy at the Netherlands Carillon School in Amersfoort, Netherlands, where she studied with Todd Fair. In 2016, Ellen conceived and executed the largest new music project in the history of the carillon art, commissioning "50 for the 50th", 50 new works in honor of the 50th anniversary of the Yale Memorial Carillon. The 50 commissions consisted of 47 pieces of concert music for carillon, an illustrated children's book "Rosie Meets the Carillon," a book of 48 carillon studies in all keys, and an historical exhibit. The project brought about new works from some of the finest established composers of carillon music, and the project encouraged many composers new to carillon to write for the instrument. Ellen is Artistic Director of Music on the Hill, an independent music organization with four performing ensembles and music education opportunities. Over a period of twenty five years, Ellen served as Music Director and Organist of five churches. She has founded a number of choruses and handbell choirs, and has introduced many people to handbell ringing. She has composed a number of multi-movement works for handbells, including "I Lift My Lamp" and "Where the Heart Dwells." Ellen holds the Master of Music in organ performance from the Yale School of Music and Institute of Sacred Music, and the Bachelor of Arts in music from Yale College.